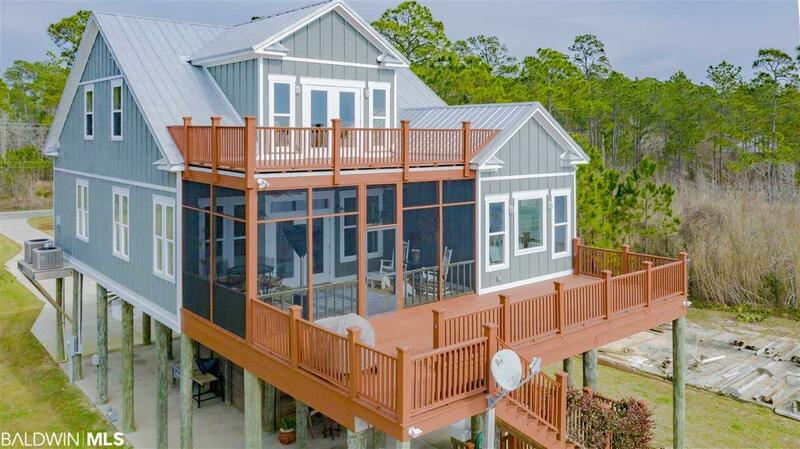 This beautiful home on Mobile Bay captures those gorgeous eastern shore sunsets in every way possible. You can relax on the 12x35 lower deck, dine al fresco in the 12x21 screened in porch or view the stars from the 12x21 upper deck or stroll out to the pier. You will also enjoy the view from inside this lovely home as it has lots of large windows, french doors and 10&apos; ceilings. The kitchen is grand with an oversized granite island complete with under counter storage and Bosch appliances and walk in pantry. The guest bedrooms have large walk in closets and share a beautiful guest bath with double vanities. The master has the best view of the bay and the en suite is luxurious with a jetted tub and separate vanities made with Alabama Marble. This newer home has energy saving foam insulation, lots of attic storage (including plumbing for a kitchenette) and an extra space upstairs for hobbies. Outside you will find lots of young fruit trees, a raised herb garden, and your own sandy beach with palm trees and fire pit. There is a large 10x18 louvered workshop under the house for storage and parking for 4 cars. The pier takes you to a covered 20x20 dock complete with water, electricity and cable. You will feel quite relaxed here as there are vacant lots on either side of this home and you can choose to join the Y-Weeks Community Association which supports community events. Catch your sunset in this dream home.